Located in St. Louis City real estate, homes for sale in Dogtown St. Louis MO are conveniently located within walking distance to Forest Park. Dogtown Real Estate and Dogtown properties are a perfect addition to the St. Louis Real Estate market. Dogtown real estate is primarily older, historic homes with the exception of a few tear downs. The Homes for sale in Dogtown MO range in price from approximately $75,000 to $375,000. The median home price in 2014 was approximately $180,000. The Dogtown area is known for its traditionally Irish heritage and their annual St. Patrick’s Day Parade. Although minutes from downtown it has a small town community feel with numerous local bars and restaurants. It is also known as the Clayton/Tamm area. The Dogtown residents are served by the St. Louis City School District including Roosevelt Senior High. See Great Schools for up to date ranking on every school in the area. If you are looking for a home for sale in Dogtown MO or you would be interested in buying a home in Dogtown, please contact St Louis County real estate expert, Sharon Colona and St. Louis Realty for a professional and simple buying or selling process. Call (636) 397-7653 or email at scolona@stlouisrealty.net. BRAND NEW HOME walking distance from 50+ awesome restaurants The Hill has to offer! Fantastic open floor plan combines the living & dining rooms & phenomenal kitchen with stone tops & stainless appliances. Upstairs you'll find a wonderful master suite with drop dead gorgeous full bath & walk-in closet! Two more bedrooms, an office, laundry & a second full bath round out this level. Professionally finished basement adds a family room, fourth bedroom with proper egress + a fourth bath upping the home to over 2700 square feet of living space. Oversized 1-car garage & private fenced yard. Lots of fantastic extras such as whole-house surround sound & hardwood floors. Gorgeous new home in a terrific neighborhood that will make you happy for many, many years to come. Move in across the street from the park! 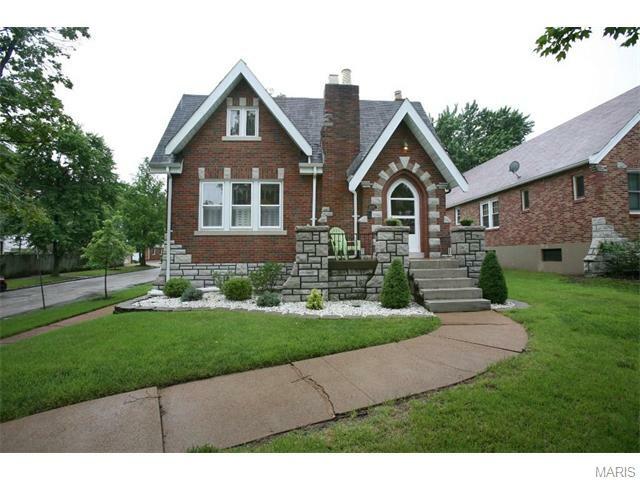 Beautiful 3 BR/2.5 BA rehab with spacious open floor plan across from Tower Grove Park. Enjoy easy living, with all new appliances and HVAC, new hardwood floors, new roof, new plumbing and electric, lots of off-street parking, deck + master BR balcony. xD; xA; xD; xA;Second floor Master Suite includes large 2 sink bathroom, walk-in closet, walkout balcony and washer/dryer hook-up in the hallway. xD; xA; xD; xA;Large .2 acre fenced-in backyard has plenty of room for a detached garage and swimming pool. Seller can build a 2,3 or 4 car garage and driveway if requested. Cost of construction to be added to sales price. xD; xA; xD; xA;City living at its finest: Walkability score 65/ Bikeability score 84. This is your opportunity to own BRAND NEW CONSTRUCTION in the heart of South City. Beautifully constructed open floor plan combines the family, living, dining and kitchen on the main floor. Featuring high end stainless appliances, granite tops and an island fit for royalty, you will love entertaining in this home. Upstairs you will find a gorgeous master suite with a huge walk in closet and en suite with double sinks. Two more spacious bedrooms, each with their own walk in closet, and a second full bath complete the second level. Head to the basement where you will find the fourth bedroom with a walk in closet, the third full bath and a huge rec space increasing your total living to over 2600 square feet. This house will also feature a sleek metal roof! A 1 car detached garage with a huge patio and a private fenced yard. Walking distance to many great City parks, restaurants and shops. Early contracts will allow for buyer choice of finishes, schedule your appointment today! Check out this rare find - affordable, newer construction in the city! Its ready for you to move in and start enjoying the coffee shops, markets, bars, restaurants and parks that are all just minutes from your front door. Hardwood floors guide you through the open floor plan while natural light pours in through the large windows. Chef's kitchen features 42 glazed cabinetry, granite counters, center island and stainless steel appliances is completely open to family room/breakfast area. 9' ceilings, Second floor features laundry room, spacious bedrooms, including the master suite - equipped with walk-in closet and luxurious private bath. You'll find fresh paint, panel doors, ceiling fans, and stylish plumbing & light fixtures throughout. Newer roof, zoned HVAC, 2 car garage and deck add to this outstanding value. Open the front door into the charm of yesteryear with all the modern amenities of today's life. From the spacious entry foyer you can see magnificent stained glass windows at the stair landing, flanking the Living Room fireplace and Bluebirds of happiness which adorn the Dining Room. This home has gleaming wood floors, generously sized rooms & a Chef's Kitchen. This eat-in Kitchen is fully outfitted with a gas cooktop and double oven. The spacious sitting area off the Kitchen could be used as a Breakfast Room. The main floor offers a convenient half bath off the entry foyer. The second floor boasts a huge Master Bedroom and three other generously sized bedrooms. The luxurious bath was recently renovated and includes a separate tub and shower. The lower level has ample room for storage and a large family room with a wood burning fireplace and another half bath. The home sits on a very large lot (232' in length) with the 2 car garage close to the house. This is a real show stopper. This 3-bedroom (two second floor master suites), 4-bathroom predominately brick home has been updated with efficiency, amenity, & convenience. The first and second floor have hard wood floors throughout the space. The second floor has two full baths, a full-sized laundry off of the hall, it x2019;s own HVAC dedicated to the level, and generous volumes of closet space. The main floor space includes an open plan kitchen with a solid surface countertops, island, under-cabinet lighting, & shaker style cabinets. Original details such as stain glass & transom windows, stone fire place, & solid front door remain in use to be mixed with recessed lighting, walk-in closets, open sight lines, and double pane efficient windows. These attributes combined to create a well-designed space with a x201C;they don x2019;t make x2019;m like this anymore x201D; feeling. Located a half mile from Forest Park between highway 40 and I-44 this property is highly visible on Hampton is seen by 30,000 cars per day. Features 4 private offices, large open room with 5 cubicles, 2 bathrooms, a break room, a conference room and a large open warehouse area in the rear. This turn-key move-in ready property is 3800 sq ft and has 16 parking spots in the rear. Ideal space for a construction company or any trade that requires a warehouse or storage. Zoned residential but commercially assessed- potential for live/work. Also a potential creative space with tall ceilings, concrete floors and over-sized windows. The warehouse could also be used as additional office space. Property is currently leased for $3,000 per month and $36,000 annually with an owner option to move the tenant out. HVAC and roof was recently replaced. Owner is a licensed agent. WHAT A GORGEOUS NEWLY REIMAGINED HISTORIC FARM HOUSE! This home is a perfect example of how wonderful a historic house can be once it has modern updates! Everything from top to bottom has been fully renovated! Whether you are cooking and entertaining in the gorgeous brand-new kitchen or nestled up in the bay-window of the master bedroom reading a good book while doing laundry - every aspect of this home has been reimagined to provide modern comfort with historic charm. The home features an amazing brand-new kitchen with quartz countertops, brand new floors through-out, new stainless-steel appliances and brand-new central heating and air conditioning. When you are not enjoying the many features of the house, you can explore the South Hampton neighborhood, Lindenwood and Tilles Park or the Ivanhoe shopping district. Just an astounding home in a tremendous location! xD; xA; xD; xA;NOTE: Seller to build garage with off-street parking - wants buyer's input before construction. Park Hampton Estates Subdivision. Large home with open floor plan with fireplace, 3 bedrooms upstairs, 2 full baths. Basement is open and ready for completion. Fantastic house located in a great area. Close to beautiful park. There is a lot of space with 2 stories with a finished basement! Beautiful bamboo flooring in the living room and hard woods and ceramic tile throughout. Call today for your showing!! TO BE BUILT ** Be the owner of a NEW home in South City! Experienced builder can provide references upon request. Home will come with a 1 year builder warranty and a 10 year structural warranty. Options included in base price: Granite kitchen tops and engineered hardwood floors on main floor. Any upgrades can be added to suit buyer's needs. Choose all your own finishes!! Beautiful two story home in the Lindenwood Park neighborhood is sure to please! Stunning stained glass windows, and gleaming hardwood floors throughout the main level is just the beginning! The home opens to adjoining, spacious, sun-filled living and dining rooms. The large eat-in kitchen features sparkling white cabinetry, plenty of counter space, a pantry and leads to a sunny family room. The open floor plan is perfect for entertaining! A full bath completes the main level. Upstairs finds a large master bedroom with walk-in closet and three additional comfortably sized bedrooms with ample closet space. A spacious beautifully updated hall bathroom finishes this level. The lower level offers plenty of storage space. Outdoors the level backyard with deck and patio is sure to be the highlight of outdoor entertaining! The charming covered front porch only adds to the curb appeal of this great home. Seller offering $4000 flooring credit. Close to highways, shopping, and so very much more. This completely renovated home is sure to please! Everything has been done for you! All new: electric and 200 amp electrical panel, water heater, high efficiency furnace, and roof. Not to mention a brand new kitchen including upgraded white shaker cabinets with soft close drawers and doors, granite counters, stainless steel appliances, subway tile backsplash, and porcelain tile floors. The tile floor continues into the all new bathroom that shines with a new tub, curved glass shower doors, vanity and loo. You're sure to love the bright sunroom with all new laminate flooring. Downstairs you will find a half bath and a full unfinished basement. Also, the original hardwood floors have all been refinished throughout and retains the original charm of this century home. xD; xA;All this and an ideal neighborhood location where you can walk to several bars and restaurants, and drive around the corner to jump on hwy 44. Don't miss out! Beautifully updated & move-in-ready 2 bedroom bungalow steps from neighborhood restaurants, cafes & shops, plus Tilles Park! The cozy covered front porch leads into the light-and-bright main level w/ gleaming hardwood floors & historic details throughout. The sizable living room flows to the separate dining room, a perfect combo for entertaining family & friends. The kitchen is loaded with updates, including stainless appliances w/ gas range & tile backsplash. Just down the hall, the main bedroom is sizable & an attractive full bath completes the main level. Downstairs, the walk-out lower level offers an additional bedroom with HUGE walk-in closet. A cozy family room features custom wood walls while the newly renovated full bathroom adds tons of convenience. Outside, Summer time bbq's are a breeze in the HUGE back yard (double-size lot)! Other highlights: newer windows throughout, newer plumbing/lateral & oversized 1-car garage, plus easy access to I-44 and Home Warranty included! This is one to get excited about!! This charming 2 bed, 1 bath home in south city literally has it all! Brand new updated kitchen with granite countertops, stainless steel appliances, 2 generously sized bedrooms, beautiful hardwood floors, tons of natural light & the cutest sunroom just off the kitchen, which is the perfect spot for your morning cup of coffee. Partially finished lower level is perfect for a mancave or kids play area. Additional features include private driveway, oversized one-car garage, paver patio, landscape lighting & inviting front porch to relax after a hard days work. Perfect location & within walking distance to parks & restaurants. xD; xA;Do not miss this one! Live in the very desireable Hill Neighborhood in this cohfortable family home. Three bedrooms and an additional bedroom in the lower level. First floor family room. Updated kitchen, micro-wave. New concrete porch and basement floor. Updated windows.Some updated plumbing. Walk to all the things that the Hill Neighborhood has to offer. Beautiful rehab creates a Dogtown Delight in this coveted location! Gorgeous 2 bedroom, 1 bath all brick bungalow has been completely rehabbed with top quality finishes! Beautiful hardwood flooring throughout. Fully updated kitchen with granite counter tops, soft close cabinets, tile back splash, high end appliances, including a stunning, brand-new Big Chill retro refrigerator! Completely updated bathroom with tile flooring and tub surround. Tons of parking thanks to a 2-car garage in back with automatic opener along with a front driveway and street parking. Enjoy entertaining or tranquility on the private, covered back deck overlooking the fenced back yard. New lighting, paint, water heater, plumbing, landscaping and sidewalk add to the value of this one-of-a-kind home! The clean and dry walk-out lower level offers potential to double the living space! Great location with easy access to major highways, Dogtown restaurants, Forest Park and much more! Schedule your showings today!